The Race and Social Justice Initiative (RSJI) is proud to announce the recipients of the 2018-2019 Student Leadership Award. The Student Leadership Award recognizes and supports College of Charleston students with a passion for race and social justice activism. Click here to learn more about the Student Leadership Award. Click to view Vanity’s proposal: Vanity Reid Deterville Student Leadership Award Proposal. AIDSWatch: AIDS United Annual Conference in Washington D.C.
Synopsis: I will be attending the AIDS United AIDSWatch annual conference in Washington, D.C., which will be held April 1 & April 2, 2019. AIDSWatch is the largest annual constituent-based HIV/AIDS national advocacy convening in the nation. It is my hope the information I gain at the conference will further my work with HIV/AIDS policy in the State of South Carolina. With the help of Palmetto Community Care and the Ryan White Wellness Center, I plan to use this information to develop better means of community collaboration and to address the prevalence of AIDS in Charleston. AIDSWatch strives to connect healthcare professionals, concerned citizens, and congressional leaders in a common space. By facilitating this shared ground, the conference fosters diplomatic discussion of AIDS as a complex virus as well as the medical, social, and political factors it affects. Having made instrumental connections through AIDSWatch, I plan to study the plan of legislative action Senator Scott Wiener of California took to lessen the stigma surrounding HIV/AIDS and to treat the disease as all other communicable diseases are. Biography: Vanity Reid Deterville is a native of Charleston, South Carolina. She is currently a junior pursuing a degree in Political Science with a concentration in Public Policy from the College of Charleston. Through her efforts with We Are Family, an organization dedicated to Charleston’s LBGTQ youth, the Charleston YOUth Count, and The College of Charleston Joseph P. Riley Center for Livable Communities, Deterville has dedicated much of her time as an activist to LGBTQ initiatives and to populations in the Lowcountry who are experiencing housing and food instability. She believes tradition has sometimes maintained a restrictive stronghold on Southern families and queer youth of color. As a new Facilitator of the “Transformative Teaching Collective,” she is an advocate of restorative justice. Defined as the art for social change and the appropriate implementation of those changes for inclusive and progressive thinking, restorative justice provides support and professional development for marginalized groups like the LGBTQ community and people of color. 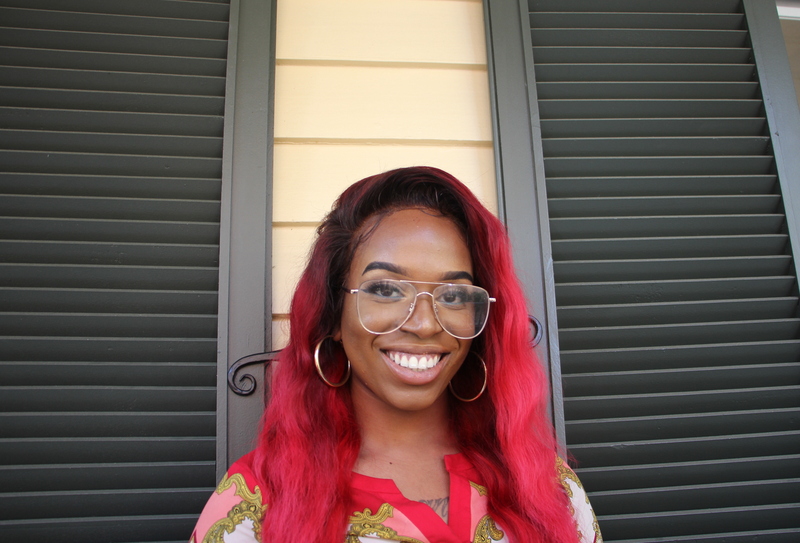 Through her work with the Eastside Community Development Corporation, Deterville has become a steadfast activist for equitable and accessible housing for marginalized communities in Peninsular Charleston, SC. Click to view Sylvie’s proposal: Sylvie Baele Student Leadership Award Proposal. 2019 National Bike Summit: Hosted by The League for American Bicyclists in Washington D.C.
Synopsis: I am seeking a grant from the Race and Social Justice Initiative to provide funding for my participation in the 2019 National Bike Summit. Attending the Bike Summit will allow me to better understand the methods, challenges, and practices of increasing bike use as a means of transportation for college students and minority populations in the area, specifically those who are negatively affected by gentrification, urban food deserts, and unequal housing and employment opportunities. I am deeply passionate about the empowerment and opportunity that bike transportation provides users, and I believe that making those benefits accessible to populations in need can ameliorate some of the racial disparities that exist in Charleston County and set a precedent for the region. Providing these beneficial transportation and economic opportunities is not a zero-sum game as it will not negatively impact others on campus or in the greater Charleston area. While it may seem strange to some, I know that bicycles can be the link between resilient social, economic, and environmental development. They are instruments of social justice because they revolutionize mobility, provide economic freedom, and bring physical and emotional health benefits to riders, especially to those with no other form of efficient transportation. Biography: Sylvie is a Charleston native and completed her undergraduate studies at the College of Charleston, graduating with a B.A. of International Studies and a minor in Environmental Studies. 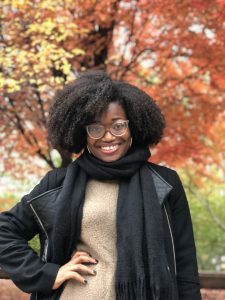 Throughout her time as an undergraduate student, she found her calling as a local activist with a focus on social justice, academic freedom, and institutional accountability. In 2015, she was awarded the College of Charleston’s Pat Kelly Award for Outstanding Leadership in Social Activism. After graduating, she took a break from academia and dove into the world of adventure travel and ski bum life. She spent winters in Alta, Utah and worked as a guide in the San Juan Islands in Washington, as well as in Crater Lake, the Grand Tetons, Yellowstone, and Yosemite National Parks. Sylvie is currently a graduate student at the College, pursing a Master’s in Public Administration with a focus on Nonprofit Management. Her passions revolve around all things related to bicycles and social justice. 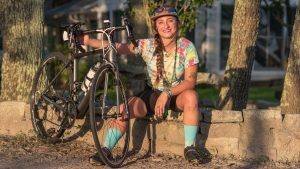 One of her most recent accomplishments was winning the First Annual Sturcken Oratorical Competition, in which she detailed her proposal to implement a “Better Bicycling Initiative” at the College of Charleston. In her free time, she volunteers as the Director of Development & Marketing in the local nonprofit Second Chance Bikes and as the local liaison for Bicycle Benefits. 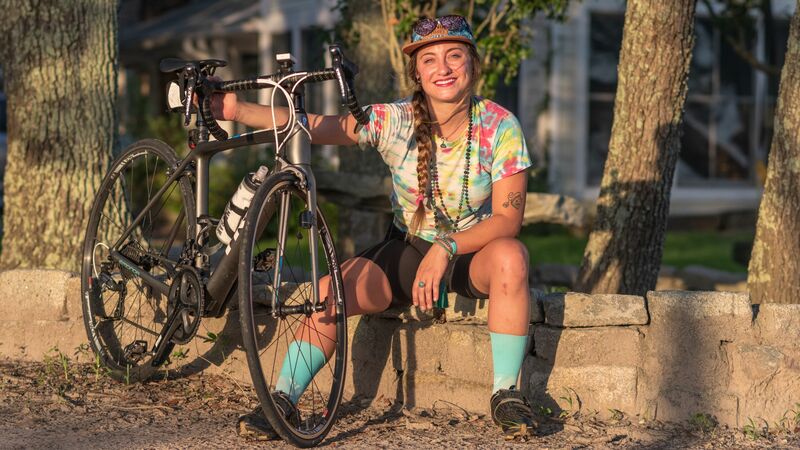 She is dedicated to cultivating her vision of a more bicycle friendly world in all she does and is eager to lead others to develop a deeper appreciation of bicycles as tools of social justice, strengthening and empowering users and communities in a myriad of meaningful and intersectional ways. Click to view Thomasena’s proposal: Thomasena Thomas Student Leadership Award Proposal. Synopsis: This past December, I traveled to the East African nation of Rwanda to engage in international missionary work. Through my efforts in Rwanda, I was able to gain insight into the nation’s reconciliation process following the tragic Rwandan genocide of 1994. Because reconciliation is still a relevant topic in our current society, I wanted to bring the knowledge I learned while overseas back to the College of Charleston. My experiences in Rwanda have given me a nuanced perspective on reconciliation in general and what that means for resolving the current differences that exist within our campus community. While in Rwanda, I worked with Hope On A Thousand Hills, an organization with the mission to provide native Rwandans with education, agriculture, and nutrition classes, and Slum Ministry, which works to provide women with entrepreneurship classes to further their societal advancement. The purpose of both organizations is to provide the people of Rwanda with the tools for a holistic and sustainable lifestyle. Since returning home, I have reflected on the people of Rwanda. Although Rwandans may look physically different from one another, they are keenly away of the past pains in their country. Above all else, they strive for oneness. By sharing the lessons I learned while in Rwanda, I hope to show my fellow College of Charleston students why reconciliation is important. 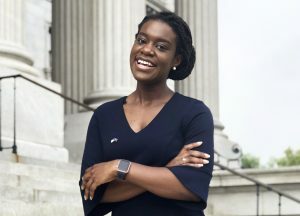 Biography: Thomasena Thomas is a junior at the College of Charleston. She is pursuing her bachelor’s degree in Political Science with a concentration in Public Policy. Thomasena is from Florence, South Carolina and comes from a family of entrepreneurs. When she was 15 years old, Thomasena founded a cupcake and confectionery company, FairyCakessc, with her sister, Thessalonia. They created the company with a unique mission and purpose to provide the youth of South Carolina with the skills, knowledge, and encouragement to pursue their career goals through culinary and leadership classes as well as mentoring programs. Inspired by the creation of FairyCakessc, Thomasena became involved with educational policy reform. She is proud of her advocacy work as a student ambassador for the Save the Children Action Network and as Secretary of State for the South Carolina Student Legislature. In the future, Thomasena hopes to become a Teach for America Corps member, Broad Residency leader, and, potentially, the United States Secretary of Education. Through career and technology education programs, she aspires to provide the students of South Carolina and residents in underserved communities with access to vital career shaping resources. In her free time, Thomasena enjoys teaching baking classes and growing in her faith walk by writing devotional pieces for Seele Magazine. Click here to view Thomasena’s personal website. 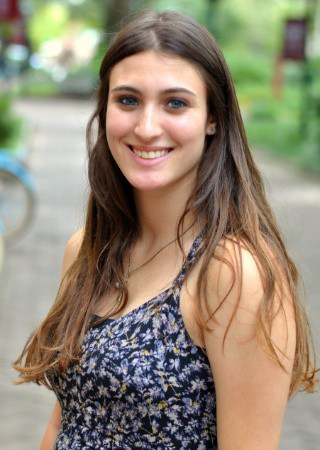 Click to view Allie’s proposal: Allie Stern Student Leadership Award Proposal. Synopsis: Black Lives Matter: Looking at Charleston will examine how institutionalized racism affects Charleston’s African-American community in the form of police brutality and race based violence. Assessing both the City of Charleston and the College of Charleston, students, faculty, staff, and members of the greater Charleston community will have the opportunity to hear from local Black Lives Matter activists. Furthermore, attendees will be able to utilize campus and community resources to work towards intersectional and systematic change. With knowledge of these resources, attendees will have the tools to deconstruct racial disparities and engage in social justice activism themselves. Biography: Allie Stern is a senior at the College of Charleston, pursuing a B.A. in Public Health. Following graduation, Allie aims to become a racial health disparities educator and to utilize her experience as a student activist in her work. She is interested in the way institutionalized racism threatens equity, particularly health equity, in African-American communities. More specifically, Allie is passionate about Black Lives Matter and the need to bring intersectional and systematic change to the College of Charleston as well as the greater Charleston community. Allie is a Ketner Emerging Leaders Scholarship recipient and holds a dual internship in public health and racial equity at YWCA Greater Charleston. Click to view Ebony’s proposal: Ebony Venson Student Leadership Award Proposal. Synopsis: I am seeking the Student Leadership Award from the College of Charleston’s Race and Social Justice Initiative to pursue research on Black women in elected office. I aim to identify and analyze barriers that impact the electoral success of Black women. Through examining these circumstances, I hope to gain insight on how to create a framework that will help advance Black women’s political participation and attain a reflective representation in elected office at various levels of government. By attending the Taste of Emerge Conference, I hope to expand my knowledge on creating an environment for Black women to run, win and lead. Participating in this conference will encourage me to harness my power as a Black woman, run for office, and become the lifeblood of my community, fighting for a just and racially equitable society. Biography: Hailing from the All-American city of Hartsville, South Carolina, Ebony Venson is a first year Master of Public Administration student with a focus on local government. A recent graduate of The College, she received a Bachelor of Arts in Political Science with minors in Criminal Justice and Urban Studies. Fighting on the front-lines for diversity, Venson participated in several campus organizations to recruit, retain, and empower students of color at The College of Charleston. Fueled by her desire to delve further into the field, she obtained a position as an Undergraduate Assistant for the Race and Social Justice Initiative at the Avery Research Center for African American History and Culture. Venson currently works as a Graduate Assistant with the Community Assistance Program and interns at the Mayor’s Office for Children, Youth, and Families. Upon graduating from the MPA program, Ebony hopes to land a job in the public sector and continue furthering her education. Click to view Malayna’s proposal: Malayna Nesbitt Student Leadership Award Proposal. Synopsis: For my research project, I have chosen to focus on the issue of environmental racism and its direct causation of health disparities in minority communities in the Lowcountry area. I plan to visit facilities and organizations who study these issues while interviewing residents of the Lowcountry area on their experiences with environmental injustices. With my findings, I hope to inform and engage the community, particularly those who do not experience these disparities, and devise a possible solution to eliminate this issue. Biography: Malayna Nesbitt is from Washington, DC. She is currently a junior at the College of Charleston, majoring in Public Health and minoring in African American Studies. 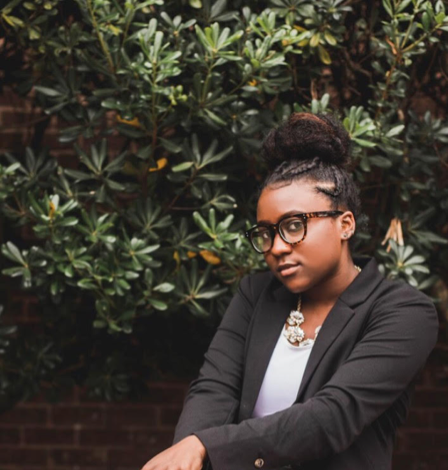 At the College of Charleston, she serves as the Co-President of the Human Rights Alliance, Recording Secretary of the Black Student Union, Student Alumni Associate, and a Student Ambassador for the Office of Admissions. She has been interested in public health issues since high school and has focused on equal access to healthcare, disease prevalence within underserved communities, and environmental racism. After completing her undergraduate studies, she plans to continue working in Public Health. Malayna is also an accomplished violinist and pianist. Click to view Ethan’s Proposal: Ethan Davis Student Leadership Award Proposal. Synopsis: I will generate a comprehensive presentation informed by key points from two main research projects I will be conducting this semester. The first project will provide a theoretical framework for community development. The second project will host A) a critical analysis of the methodology researchers have used to identify obstacles to community growth and progress and B) two honest dialogues with long-term residents of Chicora, a socially and economically disadvantaged community in North Charleston. The second project will provide a unique perspective of a historically silenced peoples by allowing them to speak for themselves and articulate their own thoughts on best practices to develop their own disadvantaged and abandoned communities. The overarching goal of my work is to gain a holistic understanding of theories on community development and the ideal way to execute community development efforts by taking into consideration the lived experiences of those long-term local residents who have already been working to better their community environments. This will require the questioning of methodology in how society approaches the work of developing vulnerable communities. The presentation will include recommendations to identify best practices for tools and methods to reimagine local community development in multi-faceted and asset-based ways. Biography: Ethan Davis has lived in the South his entire life. He spent his elementary school years in Columbia, South Carolina and enjoyed middle and high school in Chapel Hill, North Carolina. College brought him back to South Carolina when he enrolled at the College of Charleston. Currently, he is a senior double majoring in African American Studies and Political Science with a minor in Jewish History. On campus, he is a Cougar Ambassador and a member of the Leadership CofC cohort. Ethan’s most meaningful experience during his college career has been his participation with the Bonner Leader Program, a civic engagement and leadership development program that connects students with local partnering nonprofits. It aims to transform college students into active citizens within their own communities by facilitating an honest dialogue. This program introduced Ethan to Metanoia, a community development cooperation with which Ethan has partnered since the fall of 2016. Metanoia operates under an asset-based community development model, which focuses on economic regeneration and establishing quality housing and youth programs. 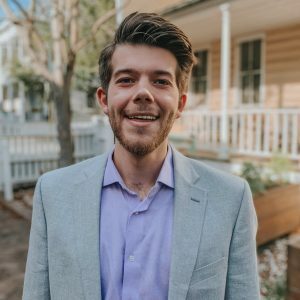 Through this holistic approach, Ethan has had the privilege of realistically applying themes and concepts he has learned in his academic courses to the greater community.